Do Dentists Love or Hate Apples? Most people are familiar with the adage, ‘an apple a day keeps the doctor away’. In recent years, this has been amended to, ‘an apple a day keeps the dentist away’ but is this true? Do dentist really think that apples are good for your teeth and oral health? There are a few dissenting opinions but for the most part, dentists give eating apples a big thumbs up. Here are 5 ways that you r teeth benefit from eating apples. When you bite into an apple (with the skin on) your teeth are getting a bit of a scrub. Crunchy foods like apples are a great way to give your teeth a clean and dislodge food that might be stuck in the crevices. Pick a crispy apple to get the best benefit (like an Ambrosia). However, dentists are quick to note that apples are a good in-between brushing solution – not a replacement for regular brushing. Good oral health requires healthy gums. Apples are fibrous and offer the gums a gentle massage while chewing. This stimulates them and promotes healthy gums. Eating apples raw is the best way to get this effect. A good apple will make you salivate – which is good news for your oral health. Saliva naturally cleanses teeth and keeps the mouth moist. A dry mouth can contribute to tooth decay (and bad breath). Ambrosia apples are an excellent choice for promoting salivation with their perfect blend of sweet and tart taste. Having a white smile is something that some people pay a lot of money for and you can have it just by developing an apple habit. One ingredient found in many teeth whitening products is malic acid, which is found naturally in apples. Regularly eating an apple has been found to decrease tooth stains. Some people opt for a natural tooth whitening paste made from apple cider vinegar (2 parts) and baking soda (1 part). The final benefit of eating apples is that they are a great substitute for candy. 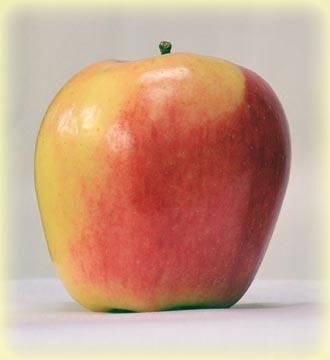 Apples deliver the sweetness we crave without the detrimental dental effects of sugary candy. And, because they are so filling and satisfying, apples will stop you from snacking all day. When it comes to dental benefits, not all apples are created equal. Some apples are too acidic which can damage the enamel of your teeth. It’s best to rinse your mouth with water after eating an apple, and to choose lower acid apples (like Ambrosia). So, bite into an Ambrosia apple every day – it’s got so many reasons to make you smile (more brightly).